North of former level crossing, Station Road North; behind the ‘Flying Scotsman’ public house. Notes: This station was opened to passengers in 1856 by the North Eastern Railway some nine years after the railway from Newcastle to Berwick on which it stood. At first it was known as Benton, and it served a scattered rural population. Although coal mining was already well established in south-east Northumberland the immediate environs of the station had little evidence of this and the land was in agricultural use. The only buildings of note within half-a-mile were St Andrew’s (now St Bartholomew’s) church to the south, and to the east, Forest Hall with its ornamental grounds. Close to the station was a short terrace of cottages known as Red Houses. Beyond Forest Hall was Wagonman’s Row, a terrace of about 20 cottages. In June 1864 the Blyth & Tyne Railway opened its Newcastle extension from Whitley Bay, and this crossed over the East Coast main line half-a-mile south-east of the NER’s Benton station. The B&T provided a station named Forest Hall, serving Wagonman’s Row, but this closed in 1871 when the company opened its own Benton station south of the NER station of the same name (replacing an earlier Benton – or Long Benton – station to the west, on the site of Four Lane Ends Metro station). On 7 August 1874 the NER absorbed the B&T company, and after a few months of owning two Benton stations the NER renamed the ECML station Forest Hall, the name that it retained until closure. The main facilities were on the up (north-east) platform. The two-storey building was on a more modest scale than at the stations which had opened to passengers in 1847; however, Fawcett (2011, in Addyman [ed]) speculates that because it is much larger than the standard crossing-keeper’s cottage on the Newcastle and Berwick line it might have been intended to handle goods traffic from the outset before passenger trains began to call. The building at Forest Hall had some of the distinguishing features of the elegant 1847 stations, such as sandstone ashlar construction and a ball finial on the gable facing the platform; there was also a canted bay window. A single-storey extension, with a glass and timber front, was added by 1897 between the building and the crossing, probably to serve as a waiting room. A further single-storey structure was added c1900 to the north-west of the main building, largely of timber, under a pitched roof, with a range of windows, and this provided further waiting accommodation. At some stage between 1859 and 1897 the down platform - where more passengers would be expected to alight than to join trains - was provided with a small, enclosed timber waiting shed which had a pitched roof and scalloped bargeboards. Adjacent to the level crossing was a standard curved-profile NER footbridge. This graceful design was made up of cast iron parts which were erected on site. The castings were lettered and numbered to facilitate assembly. Regrettably the original standard drawing for these bridges is undated, but they appeared at many NER stations in the late nineteenth century. A signal box, opened by April 1889, was prominently perched above the ‘up’ side of the footbridge. One set of steps to the footbridge enabled passengers to cross over the tracks, and another was provided for non-rail users to cross the line when the gates were closed. A further staircase continued upwards to the signal box. No goods sidings were installed at Forest Hall, but the RCH Handbook of stations (1904) indicates that goods traffic was handled; this will have been small items that could be dealt with at the passenger platform. Bradshaw of February 1863 shows three weekday southbound departures from Forest Hall (then called Benton) with a further train on Saturday; only one train called on Sunday. In the opposite direction three weekday trains called and one on Sunday. NER statistics for 1911 reveal that 40,491 tickets were booked at Forest Hall, and that 2,043 people lived within the station’s catchment. Nearby Benton (with a newly introduced, frequent electric service to the new terminus of Manors North in Newcastle) issued 177,003 tickets in that year. By the early twentieth century residential development was spreading across the former farmland south and east of Forest Hall station, but there was no significant industrial employment in the vicinity. A small area of terraced housing had been built immediately east of Forest Hall station, but to the south (towards Benton) larger houses with gardens had been built. To the west the land remained open. The growing local population will have encouraged the NER to build the additional accommodation at the station. In 1923 at the Grouping the NER network became part of the London & North Eastern Railway. Two years earlier the NER drew up plans to construct a diversionary route avoiding Newcastle, principally for freight traffic, and this would have parted company with the ECML about a mile south of Forest Hall. In 1924 further changes to increase the track capacity of the northern approaches to Newcastle were planned which would involve quadrupling the ECML through Forest Hall and rebuilding the station; the level crossing was to be replaced with an overbridge to the south-east which would give access to the new station building above the tracks. Alternative plans were drawn for the new station building, both envisaging a handsome classically-styled structure with a central clock cupola. Neither the diversionary route nor the quadrupling was to be constructed; only the overbridge came into being, but that was 40 years later. In the 1920s and ‘30s competition from road transport became intense. Bus services to and from Newcastle were much more frequent than the trains, and a tram route operated along Station Road as far as Great Lime Road, passing directly by Forest Hall station. It is likely, too, that some members of the relatively affluent community in this outer suburb of Newcastle invested in cars. As noted earlier, Benton station on the electrified ‘North Tyneside Circle’ was within easy walking distance of Forest Hall, and the extension of direct services from Manors to Newcastle Central will have enhanced the appeal of that station over Forest Hall. Nevertheless the frequency of trains in Bradshaw of July 1938 had increased slightly compared with 1920. Nine weekday southbound trains called at Forest Hall, with one extra on Saturday, and three calls on Sunday. The needs of commuters to Newcastle were met by morning departures at 7.27, 8.22 and 8.56. Newcastle Central was reached in 13 minutes on the first two trains, and the 8.56 which did not call at Heaton could whisk passengers to Manors in eight minutes and Central in 11 – much more rapidly than road transport could have offered, and a little faster than the electric trains from nearby Benton station. Northbound there were eight weekday departures, with one extra on Thursday and Saturday, and three trains on Sunday. The LNER, far from rebuilding Forest Hall, did little more than install new running-in nameboards, and the station remained lit by gas. In peace time the final LNER timetable (October 1947) showed a service frequency little changed from 1943, but trains no longer travelled via Benton. In January 1948 Nationalisation of the railways abolished the LNER and thereafter Forest Hall was in British Railways’ North Eastern Region. In summer 1952 this and the other minor stations on the ECML in Northumberland suffered a marked reduction in their train frequency, as 1951 figures indicated that passenger bookings were in decline, and only 1,928 tickets had been sold at Forest Hall. The timetable now showed only two southbound departures at 8.41am and 5.40pm on Monday-to-Friday and an extra departure on Saturday at 11.11am. One train called on Sunday at 6.36pm. Northbound trains called at 7.29am, 5.17pm and 10.13pm. On Saturday there was also a 12.51pm departure. The solitary Sunday train called at 7.33pm. The winter 1957-58 timetable effective from 16 September trains showed that trains ceased to call at Forest Hall on Sunday. The summer 1958 timetable showed the same frequency of weekday departures from Forest Hall as in summer 1952, but with adjusted timings. Forest Hall station closed on 15 September 1958 in the ‘mass extinction’ of East Coast main line roadside stations in Northumberland. In the winter 1958-59 timetable Forest Hall disappeared. For some years North Eastern Region timetables had acknowledged the closure of stations and advised disconsolate passengers of the bus companies whose services could be used; but the many closures went unrecorded in the winter 1958-59 book, and the next few editions continued this unfortunate practice. The regional map folded into the timetable had presumably had been printed earlier and still showed Forest Hall, Killingworth and Annistsford, but with the other stations that closed at the same time erased. Perhaps the closure of these three was confirmed later than their neighbours? After closure Forest Hall station remained intact for some years, with only the absence of nameboards suggesting that it had closed. It was in this period, aged 9-or-so, that I became aware of this disused station when visiting my aunt and uncle’s shop, Stobie’s Stores, close by. My father must have made my interest known to the signalman who (in days before the obsession with Health and Safety!) allowed us to stroll up and down the southbound platform. Having admired the disused and inaccessible Byker station from Heaton-Newcastle trains, it was clearly a defining moment to stand on a disused station … and the rest is history! By November 1963 the platform faces and the northern part of the down platform had been destroyed, and the station was demolished in December 1964. The signal box, which had been reduced to operating only as a gate box on 6 October 1940, closed on 7 January 1965 and was demolished two months later. The level crossing was sealed off and a’ flyover’ replaced it, removing not only the obstruction that the gates had caused to road traffic but also a right angled bend in the road. In May 1967 the ‘Flying Scotsman’ public house opened immediately behind the former up platform. The NER footbridge remained in place adjacent to the level crossing, but it was replaced with a taller one to provide clearance for the wires in advance of the electrification of the route. Fortunately several excellent photographs taken around the time of demolition have come to light and are included in the gallery - they are currently captioned ‘Alan Young collection’, but if the name of the photographer can be supplied the credits on the captions will be altered accordingly. 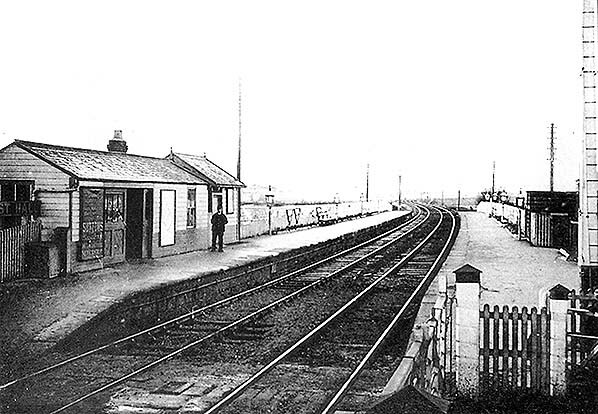 Forest Hall station looking north-west from the level crossing c1900. The main building is out of sight, to the right. The platform beyond would soon have a single-storey building added which provided additional waiting accommodation. 1859 1: 2,500 OS map. Until 1874 Forest Hall station on the East Coast main line was called Benton. The map indicates that the station stood in a sparsely populated rural landscape with only the short terrace of Red Houses close by. The station building, north-east of the railway tracks, is shown as cutting across an existing road, and the re-routed road – later known as Station Road – has been added to the map. The gentleman’s residence of Forest Hall lies some distance east of the map extract. 1897 1: 2,500 OS map. By this time the station has been renamed Forest Hall, but it is simply shown as ‘Station’. The down platform building has appeared since the earlier map was published, but the footbridge has not yet been built. Although the station handled goods traffic, no sidings were ever provided.The presence of the station has encouraged residential development of superior terraced houses with gardens and some larger, detached houses in the own grounds, such as Springfield Cottage (lower right corner). 1919 1: 2,500 OS map. The suburb (or ‘village’ as residents preferred to call it) has continued to grow, with disjointed development of short terraces east and north of Forest Hall station. The station footbridge is now shown, as is the additional waiting block on the up platform, north-west of the station building. 1955 1: 1,250 OS map. Residential development has taken place on three sides of Forest Hall station, but immediately west the land is still in agricultural use. Despite the substantial population within easy reach of the station, by this date the train service had been greatly reduced and the station closed in 1958. In the early 1960s a small residential area was built west of the station. LNER architect’s drawing of the proposed new station for Forest Hall (1924) in connection with the intended quadrupling of the route. The building would have been constructed on a new road bridge (to replace the level crossing). Two designs were submitted: this is design A. The quadrupling plan was abandoned, possibly as a result of the economic problems which beset the country in the mid 1920s. Click here for a large version. LNER architect’s drawing of the proposed new station for Forest Hall (1924) in connection with the intended quadrupling of the route. The building would have been constructed on a new road bridge (to replace the level crossing). Two designs were submitted: this is design B. The quadrupling plan was abandoned, possibly as a result of the economic problems which beset the country in the mid 1920s. 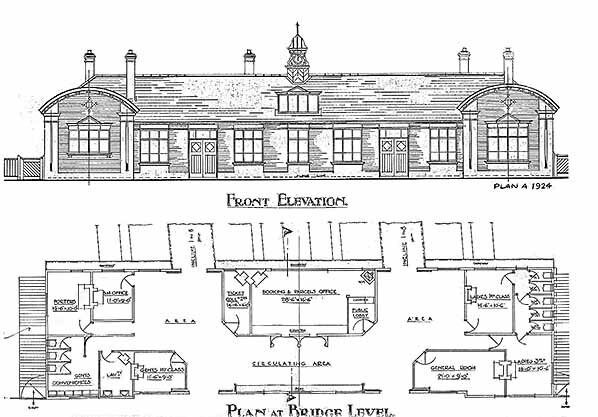 NER architect’s drawing of the station building at Forest Hall c1900. 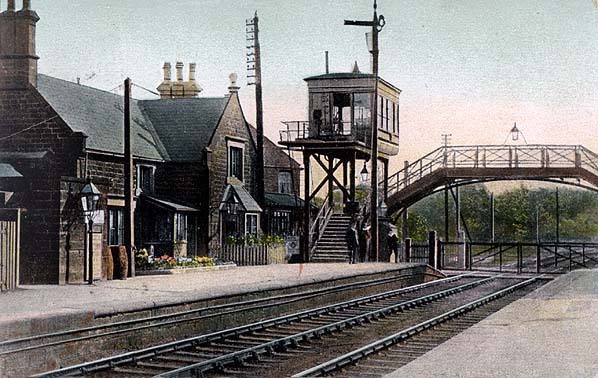 A tinted postcard view from 1908 of Forest Hall station looking south-east from the down platform.